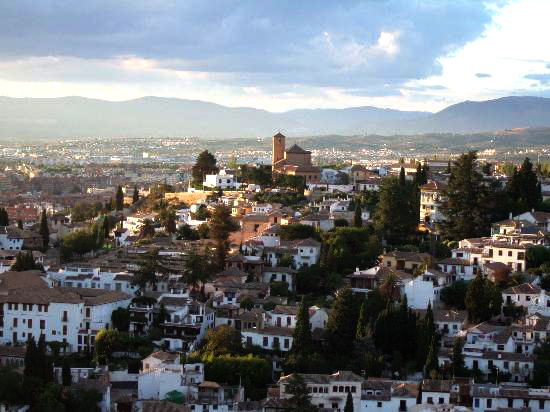 “We are in bustling Granada, a rich colonial gem of a city, full of horse-drawn taxicabs and decaying neo-classical facades, which languish a few layers of paint away from their original Spanish-era splendor. Granada is the Nicaragua of romance and myth, a veritable museum piece that quietly contradicts the woeful hard luck tales of war, hurricanes and grinding poverty that have been the staple of the international news media for decades. Nothing can prepare you for the gritty authenticity of its vibrant yet nonthreatening streets – the rocking chairs in the doorways, the atmospheric hub of the central park, the warm nods of “Buenas noches” that greet you at dusk, the simple congeniality of the people – gradually tugging away at you, taking a hold, inviting you in. 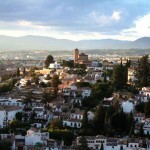 “- I read this in a travel journal a few years back and ever since, I have always wanted to visit Granada! 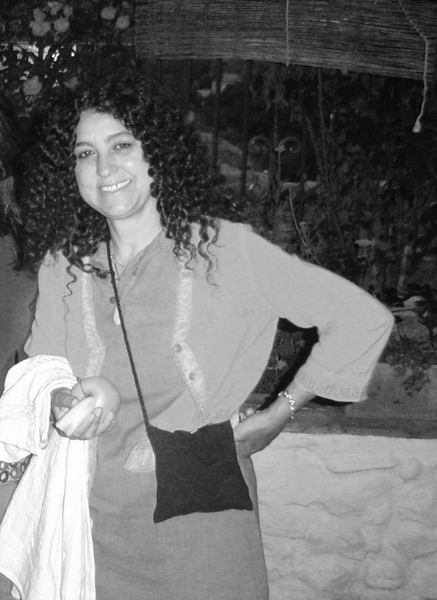 The first time heard about Cuevas el Abanico, it was an outcome of a casual conversation with our friends Nandan and Lopa,back in San Diego. A cave house, in the middle of a gypsy quarter,cascading along the slope of a hill-how fascinating is that! Several emails and vigourous planning sessions later we end up in Granada, in Kuki’s house, popularly labelled Cuevas el Abanico (The Caves of the Range). And, rightly labelled so. 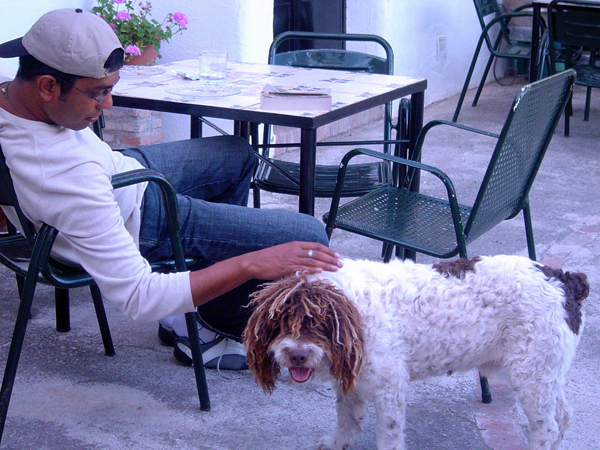 there amidst a hillock, facing the grand Alhambra on one side, with a far-ended backdrop of the snow-capped Sierra Nevada, lied this quaint little cave-house run by an absolutely adoring family, and guarded pleasurably by dog, with the curliest rasta hairdo on her! Located a mere mile or so away from the main cluster of Granada’s popular downtown hotels, Cuevas el Abanico presents a distinctly different feel to the facilities offered elsewhere. 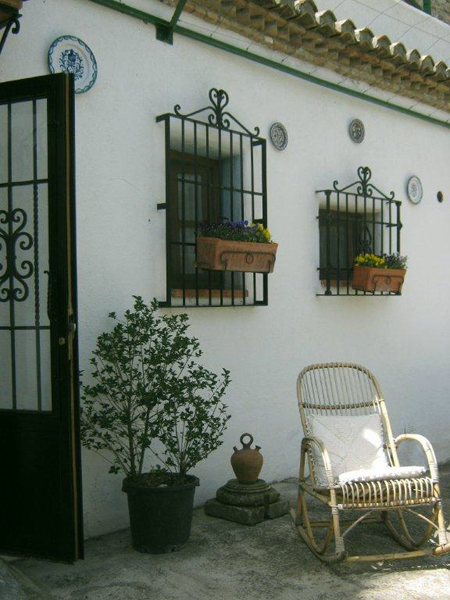 Built originally into caves on crags overlooking the steep terraced slopes of the Generalife, a quintet of simple whitewashed apartments occupy a swath of hillside that was once the prized preserve of Granada’s famous Flamenco-playing gypsies. 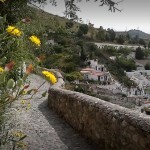 Approaching the Cuevas via the winding, contoured valley of precipitous Sacromonte, new arrivals are afforded an exuberant welcome by a floral montage of climbing peach roses. Enjoying the cool morning shade on an unpretentious front patio (which along with a narrow roof terrace acts as one of just two communal areas) we get chatting to the apartment’s friendly and engaging owner about gypsy culture, quaint country furnishings and good old fashioned Spanish hospitality. We arrived late in one early week of May. The family sat inside watching a favourite TV show. And then the connect happened! As soon, as we mentioned ‘soccer’! From thereon, becoming friends was an easy stroll! 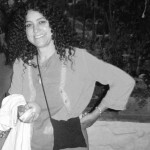 I will never forget the family dinner we shared with Kuki and Kuki’s dad. Spanish Local Food, the way its meant to be had! It’s perhaps not everyday that one is given the opportunity to live in a cave; still less in the kind of cavernous hillside dwelling that countless generations of Granadian gypsies once called home. We flipped the light switches on, check. Turned the faucet on and off, check. Hot water in the bathroom, check. Flushed the toilet, check. Plugged in the mini standing heater in the corner of the room and determined that it was working, check! All hunky-dory! These unique caves include free Wi-Fi and a cosy lounge with a fireplace and well-equipped kitchenette. They have a garden terrace overlooking the Alhambra Palace. The restored Abanico Caves have charming rustic décor, and include a modern bathroom with a hairdryer. We loved the little heater in the bathroom! Kitchenettes have a microwave, fridge and washing machine. The caves naturally maintain a constant temperature all year round. Cuevas El Abanico are just 150 metres from the Sacromonte Cave Museum, and various flamenco bars can be found within the Sacromonte caves. 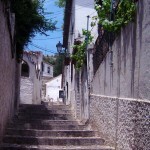 Granada’s historic Albaicin district is just a 10-minute walk away. There is unfortunately one drawback to this accommodation. It is not a hotel that you can hop on a cab and expect the cab to stop right at the front door. You see, this hotel is located a little up the hill which you can only get to by walking up a cobblestone path.Those with lots of luggages (especially stroller luggages) or have trouble walking would find it a little cumbersome to get to the hotel. Come here for a self-contained family friendly environment and a no-thrills, down-to-earth Spanish lifestyle! After a quick stroll around the area, grabbing a bite at a local tapas restaurant and capturing a few night shots, we settled in for the night, excited for our next day’s trip to the Alhambra! Seville was our next destination. And indeed we Spained Away! 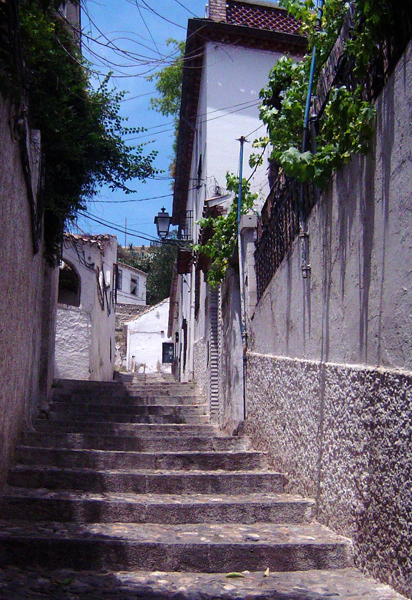 Cuevas El Abanico is located in the neighborhood of Sacromonte in Granada, Spain. 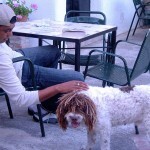 This hotel is a great option for those who are a little adventurous and would like to try staying in a cave hotel. 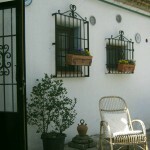 Cuevas El Abanico has little studio units that are built into the side of the hill. The cave “suites” are well equipped with lighting, heating, kitchenette and running hot water. Cell phones work here. Even if it is on an international-roaming plan. Writing directly to their email id might give you a better price and allow room fior negotiation, versus making reservations on booking.com or similar websites. The cave hotel was cozy and they provided sufficient layers of blankets to keep us warm in the winter weather. The one drawback of this hotel is that it is located on a hillside that requires you to walk up a cobblestone path. A little cumbersome for those who have too much luggage, especially stroller kind of luggage or have trouble walking. For women, heels are not recommended! You have a beautiful unobstructed view of the Alhambra (the top tourist attraction in Granada) just around the corner from the hotel. 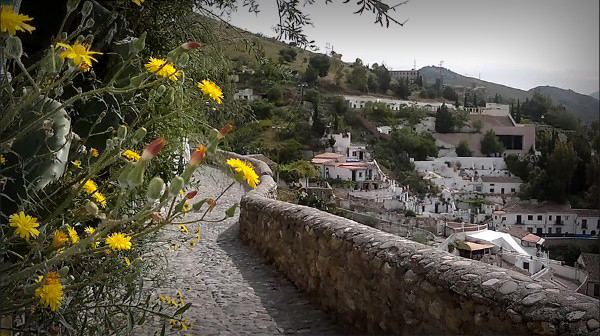 The Sacromonte hillside is a beautiful sight on its own. Walk down to the main street from the hotel (Kuki will provide you with detailed directions and a map when you check in) and take bus No.32 for a direct nonstop ride to the Alhambra (1,20 euro per ticket). Be sure to email Cuevas El Abanico after your reservations (or put in notes when you make your booking) and let them know of your arrival time so they know when to have someone there to let you in. A cab ride from the Granada bus station to the hotel is about 9 euros(as of 2007!). You then have to walk a few minutes up a cobblestone path to get to the hotel. There are painted signs showing you the way.